To get a glimpse into just how tight-knit the families are at the San Diego Ice Arena (SDIA), all you need to do is venture out the back door of the rink to find the massive stone barbeque area. It’s there that on nearly every weekend day, and even sometimes during the week, SDIA hockey director Craig Sterling, his fellow coaches, parents and players can be found grilling up great food and soaking in the family atmosphere that’s so cherished within the Oilers organization. Sometimes it’s a birthday party. Other times it’s a post-game meal. But the grill is always open to whoever brings the burgers, and it’s emblematic of the open arms that the program extends to all its players and families. Sterling has become part of the fabric of the arena and the Oilers program in his 15 years there. The hockey director for the last 10 years, the Winnipeg native loves the game, loves teaching kids to enjoy the game and never stops selling the experience to whoever will listen. That family environment comes from the top down, as brothers Phillip and Mark Linssen have run the arena since 2000. While the building itself dates back 40 years, they’ve made regular improvements throughout the years to keep the facility up to modern standards. Sterling, Belland and Scooter Henson form the core of the Oilers’ coaching staff. Like many other youth programs, Sterling and his staff put a particular emphasis on their “try hockey for free” offerings. They know that the cost of equipment can be a barrier to entry for many families, especially when kids grow so fast that skates and pads may not last more than a season or two. The program is especially important, Sterling said, in a warm-weather climate like San Diego, where many parents of young kids may not have been exposed to hockey before and aren’t quite sure what they’re getting into when they bring their young athletes to the rink for the first time. In addition to their 11 teams playing in SDIA’s in-house program and approximately 300 adult players, the Oilers have six teams competing in Southern California Amateur Hockey Association (SCAHA) play this season – Squirt B, Squirt BB, Pee Wee BB, Pee Wee AA, Bantam A and Bantam AA. Probably one of the things that Sterling is most excited about is SDIA’s foray into high school hockey for the first time this year. 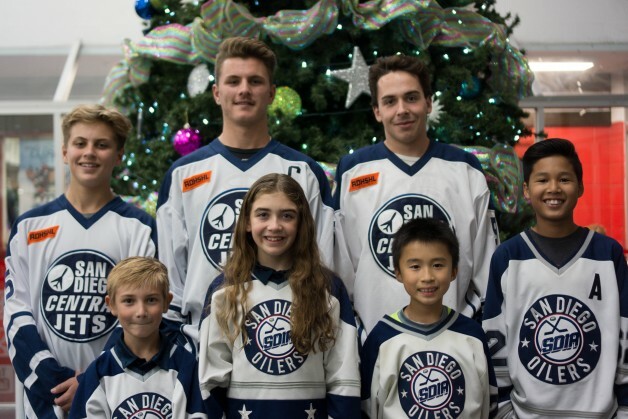 SDIA’s entrant in the Anaheim Ducks High School Hockey League (ADHSHL) is named the San Diego Central Cathedral Jets and consists of players from a number of high schools across San Diego County. Through mid-November, the Jets were 5-3 and tied for second in the Division II standings. Belland is serving as the head coach of the high school squad in its first season. The former center was a fifth-round NHL draft pick of the Chicago Blackhawks back in 1985 and played professionally through 2000, finishing his career after four seasons with the San Diego Gulls in the now-defunct West Coast Hockey League (WCHL). He said the environment and atmosphere around the rink are big reasons why he has stuck around into his ninth season with SDIA. Sterling said when he looks to the future of the Oilers program, he sees the high school program being a big part of what they do. “Our goal is to have all the kids in our program look up to the high school team,” he said. “The younger kids are seeing how good the team is, and they’re wanting to be a part of it. We used to prepare kids to play Midget AAA, but we’ve shifted our focus and are now pushing them toward the high school league. As the Oilers look down the road five, 10 or even 15 years, they envision their high school team being the top of their pyramid, with all the other teams funneling upward. They know they can’t achieve success at the top, however, without putting in the work day after day and year after year – from the learn-to-skate program to the in-house teams and each level of the SCAHA teams. Sterling doesn’t plan to change any time soon, so will keep heading back to the barbeque, grilling up those team dinners and putting together the ingredients for a successful family-focused youth hockey program. “We make everyone feel like they’re a part of something, and not just on the ice,” Sterling said. “Everyone works together to make the program better as a whole – younger kids will watch the older kids play, and the older kids will work with the really young kids to teach them the basics.